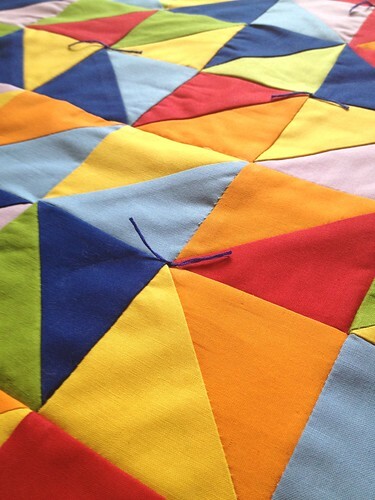 I haven't made a quilt in what's felt like ages. It's actually been since January, but given the booming fertility of my peers, that seems nearly absurd. 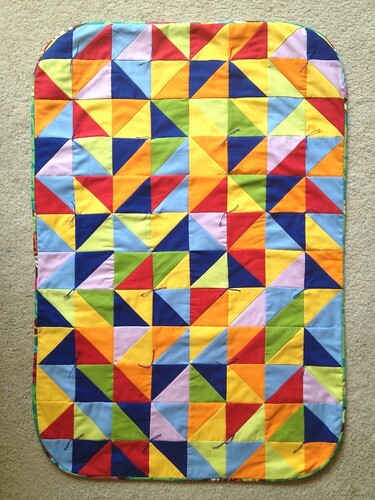 The last quilt I did was a random arrangement of solid colored triangles. I loved it so much, that I decided to give it another shot. This time, just to switch it up and give myself a bit of a challenge, I went with super small triangles. So I just cut out a whole bunch (that's an exact number) of triangles in lots of fun colors to match the backing fabric I'd chosen. Um, yeah, that was poor planning...or rather, a poor decision to not plan at all. I cut and sewed so many little triangles that it honestly felt like I was creating enough for like a California king bed, but I was wrong. 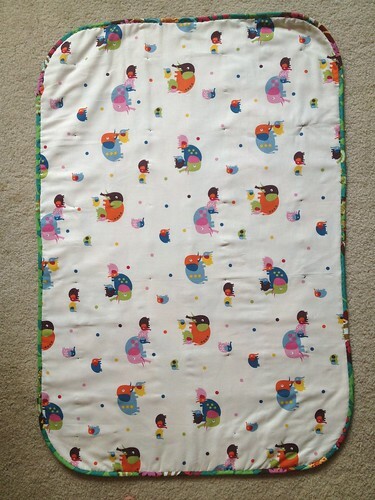 And ended up making the tiniest baby quilt I've ever made. Oops. But babies are small, right? So I just went with it. I finished it off with some hand tying (my first time trying the technique out) and some random binding left over from my very first quilt ever. I think it worked. 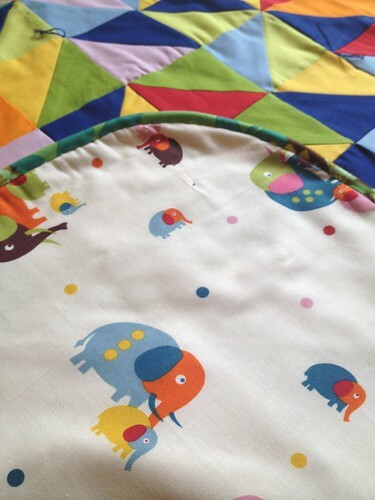 The backing fabric is Alexander Henry's Entertaining Elephants (available here). 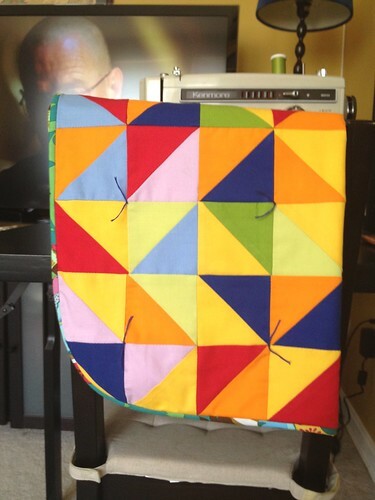 Anyway, I think it's one of my favorite quilts I've ever made...even if it is the tiniest. If you're wondering what's on TV in the background, it's Breaking Bad...our newest TV obsession. We're on Season 2. Nothing says 'congrats on the baby' like cooking meth, right? 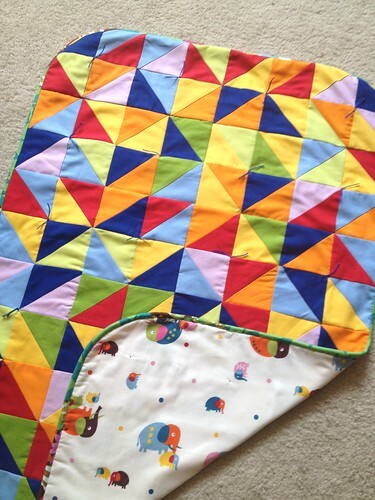 You make me want to redo the nursery just so you'll make me another quilt. Beautiful. I love this one! 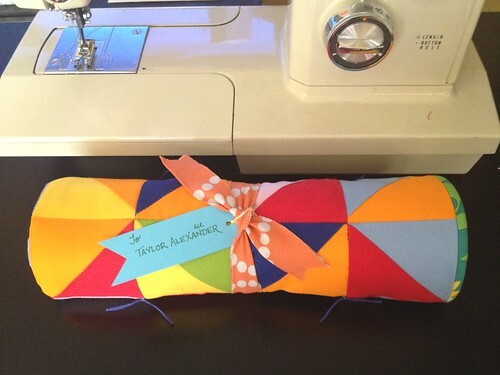 The colors are so cheery and I love the hand tying. 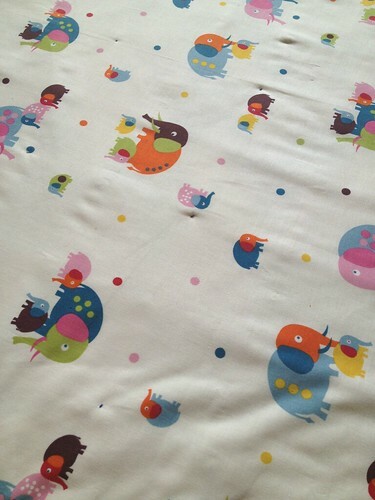 I love our quilt, in fact I slept under one last night (Nate let me use his while I slept in his room). Thanks! Also, I love Breaking Bad. My only regret is that I started before the entire show was over, and waiting for new episodes is frustrating.